LockTech24/7 is Bethlehem’s leading locksmith company. We are proud to offer you the best locksmith services in the Lehigh Valley, PA area. Availability is not an issue with us because we provide 24/7 emergency locksmith services. Our services including; car, house, and business lockout, as well as broken key extraction. We also making car keys on-site. Within the last years, we extend our services to broken lock lock repair, re-keying locks, and more. Only our Locksmiths provide the widest range of locksmith services in Bethlehem, PA.
24/7 Emergency locksmith services are our daily basis routine day and night. We are here ready for your phone call whether you’re in Bethlehem, Allentown, or Easton PA, whether you need emergency locksmith service for your car, home, or your business. Our fast and prompt response is well-known in the Lehigh Valley. Our technicians are usually arrive within 20 minutes, and many time we arrive to see smiling customers. We’re arriving quickly after your first call, working fast on site, because customers want their issues resolved in a timely manner. 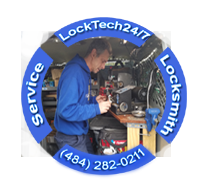 LockTech24/7 locksmith will answer the phone, provide an estimate, and perform the job. All the work done by us! It is essential that you deal with only one company to have peace in mind knowing that if any problem occur on site, you have to deal with one locksmith to address the problem. Cheap locksmith services are what it’s all about to a large number of customers. Those customers simply want to open the car that will get them to work or school in the morning without any hassle or problems. Fortunately, there is LockTech24/7 in Bethlehem and locksmith service has never been better. We have years of proven experience and we work closely with the biggest supply companies in the U.S. such as Nastf, Advanced Diagnostic, HL Flake, IDN, and more. We can understand and address the critical locksmith issues we face to solve your lock and key problems in no time.